A student-run organization pairs Carolina students with pediatric patients to provide support, comfort and friendship in difficult times. 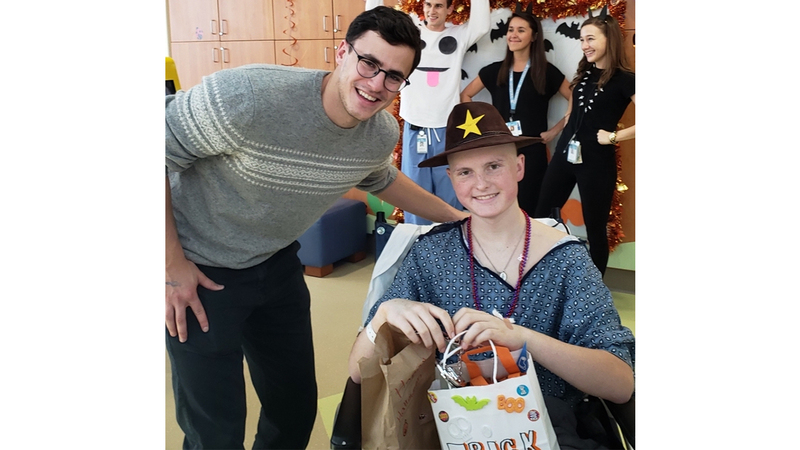 Eric Takoushian (left) goes trick-or-treating with Jake at the hospital. For a lot of children in the pediatric cancer clinic, having a friend nearby during a difficult time can make all the difference. Thanks to a student organization at Carolina, children with cancer or other blood disorders are getting that extra support. Carolina Pediatric Attention Love and Support, or CPALS, pairs trained UNC-Chapel Hill students with patients in the pediatric hematology-oncology clinic at UNC Hospitals. Meghan Fox, CPALS advisor and psychosocial support program coordinator in the pediatric hematology-oncology clinic, said the CPALS participants provide a distraction from the traumas and stresses of being in the hospital. That’s how 15-year-old Jake met one of his best friends, Carolina senior Eric Takoushian. Takoushian, who is majoring in chemistry, said getting to know Jake has been a highlight at Carolina. Takoushian was there when Jake needed an unexpected blood transfusion. He was there on Halloween to roll Jake’s wheelchair from door to door on the top floor of the hospital, where doctors and nurses hosted trick-or-treating. The program is just as meaningful for the students as it is for their patient pals. Fox said CPALS has inspired many students to pursue careers as physicians, nurses or occupational therapists. Of the organization’s nearly 200 members, more than 70 have taken the extended time and training necessary to become a one-on-one pal, Fox said. “They build rapport with the patients and gain bedside manner that they wouldn’t get in school,” she said. When Takoushian graduates in May, he plans to go to medical school and eventually work in pediatric medicine. He’ll take with him the lessons he’s learned from being part of CPALS — including a better understanding of the emotional impact pediatric cancer has on patients and their families — but he’ll also take away a lasting friendship. Takoushian’s story is not uncommon, said Liz Earley, a senior exercise and sport science major and the president of CPALS. Many of the one-on-one pal relationships born in CPALS remain lifelong friendships, and those friendships extend to the patients’ parents and siblings, as well. Even for students who aren’t paired with one-on-one pals, which requires students to be registered hospital volunteers, CPALS offers opportunities for students to make a difference in the lives of those struggling with cancer and other disorders. They decorate the clinics, organize retreats, plann teen support groups and raise funds for student scholarships. Fox said CPALS has become a fundamental part of the clinic, stepping up to help in ways she never anticipated.